The adage “Take two aspirin and call me in the morning” is destined for a futuristic makeover. Doctors may just as easily recommend swallowing sophisticated gadgets instead. That is the hope of prolific inventor Mir Imran, who has created a robotic pill to replace injectable drugs for chronic conditions such as diabetes. 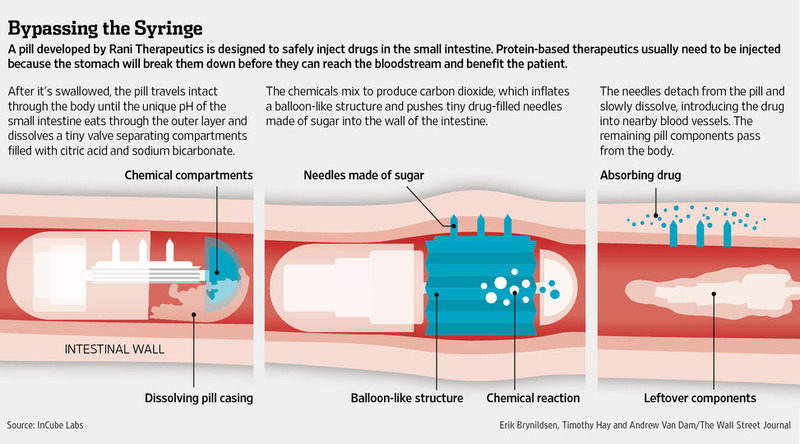 The gadget, in preclinical studies and backed by GoogleInc.’s venture-capital unit, consists of an ingestible polymer and tiny hollow needles made of sugar that are designed to safely deliver drugs to the small intestine. Mr. Imran’s pill hasn’t yet been tested in humans, so it is probably still at least a year away from even seeking federal approval. It also would require substantial financing to manufacture millions of pills. But if it is successful, the gadget has the potential to disrupt a multibillion-dollar market for injectable drugs and make life easier for millions of sufferers of conditions such as diabetes and rheumatoid arthritis. Mr. Imran is a safer bet than most entrepreneurs. The Indian-born founder of the research lab and business incubator InCube Labs in Silicon Valley has founded more than 20 medical-device startups, a dozen of which have been acquired by companies such as Medtronic Inc. owns over 300 patents and helped develop the first implantable cardioverter defibrillator to correct irregular heartbeats… Read more.